The JEE Main Physics Rotational Motion is Very helpful for all students. Now Scroll down below n click on “Start Quiz” or “Start Test” and Test yourself. A particle of mass M moves along the line PC with velocity υ as shown. What is the angular momentum of the particle about O? A force of 100 N is applied perpendicularly to the left edge of the rectangle as shown in figure. The torque (magnitude and direction) produced by this force with respect to an axis perpendicular to the plane of the rectangle at corner A and with respect to a similar axis at corner B are respectively. A plank with a uniform sphere placed on it resting on a smooth horizontal plane. Plank is pulled to right by a constant force F. If sphere does not slip over the plank. Which of the following is incorrect? When one string is cut off, the rod will rotate about the other point A. let a be the linear acceleration of centre of mass of the rod and a be the angular acceleration of the rod about A. As a figure. i.e., acceleration and hence, time of descend will be different. Friction is not sufficient for pure rolling. Therefore, maximum friction will act upwards in all the three bodies. So, linear acceleration of all the three bodies will be same and equal to (g sin θ – μg cos θ). Therefore, time taken by all the three will be same. Force of friction passes through point P. Hence, its torque about P will be zero. 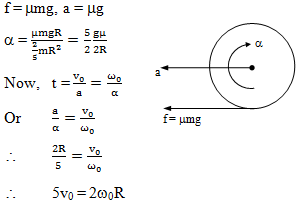 Only (mg sin θ) will have torque about P.
Initially the spring force kx is less than mg sin θ. i.e., the cylinder is accelerated downward or force of friction f is upwards. It will reverse its direction when kx > mg sin θ. In case of pure rolling bottommost point is the instantaneous centre of zero. Velocity of any pointy on the disc, v = rω, where r is the distance of point from O. Net torque about point of contact of spool should be zero. Let the particle moves from A to A’ in time dt. mg sin θ component is always down the plane whether it is rolling up or rolling down. Therefore, for no slipping, sense of angular acceleration should also be same in both the cases. Therefore, force of friction falways act upwards. A horizontal force F is applied such that the block remains stationary, then which of the following statement is false? ∴ τN ≠ 0 and torque by friction and normal reaction will be in opposite direction.